2018 is over. Kinda glad to be honest. I really needed the 7 full days we took off between season 6 and season 7 to take a breath, not be responsible for a million people and just rest. And to think about if I wanted a repeat of last year or if I wanted to do something different. Turns out I want something different. If I had to give 2018 a title, it’d be “The year I became a boss.” I’d had employees for years. But I’d never been a boss. I never was able to understand my business well enough to both lead and do. And also, I was still responsible for a large chunk of the technical side of my business (answering emails and pulling permits and creating marketing and setting up barriers and paying bills and so on). I didn’t know how to advocate for myself AND my employees and there’s also a lot of info to understand once you have real employees. If I was honest, I never wanted a team. I always wanted to be a solopreneur. So, hanging on to that thought made having team members in my life truly excruciating. In 2018, I allowed myself to believe that I could surround myself with people who liked me and liked being in this together. With that intention, I wrote six job descriptions and began to open my heart to the idea that I didn’t have to be alone in this fight. That maybe it wasn’t a fight at all. But the carrying of too much weight for one person alone. I’ve never had a team that worked so hard to make this their place of employment. To carve out a vocation within a small business, based on their own dreams for their professional lives and the desires of their hearts. However, it was rough. Being that vulnerable in front of so many people I care so deeply for was a daily struggle for me. I showed up. Day after day after day. I feel as though I’ve achieved something hard. I’m battered and proud and determined and in love with myself for it all. And something changed within me. Especially my relationship to this work. The weight was dispersed between enough of us. For once, I was able to stand up and look around instead of being hunched over working each minute. What I saw was a brilliant business that is powerful and full of love and has enormous potential to continue to change this city for the better. I saw it clearly for the first time since I began. Though we also made many hard decisions. 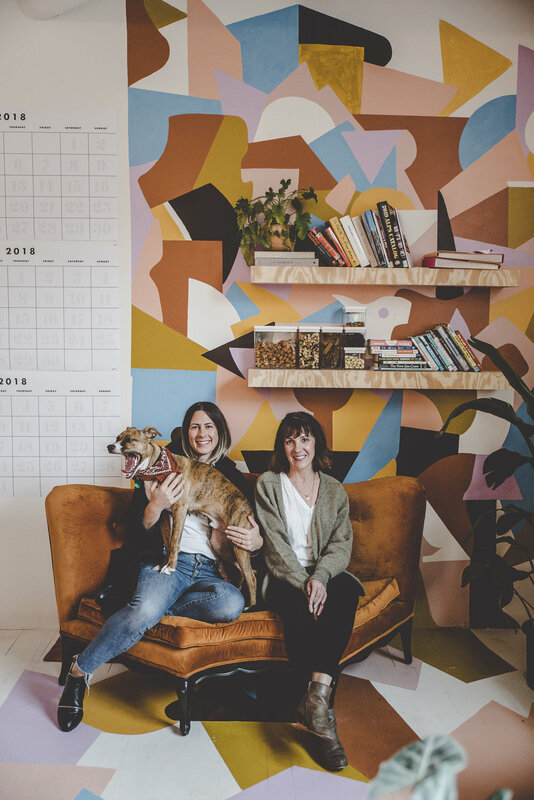 We decided to let some things go (our original office with our Lisa Quine mural), we’re saying goodbye to some people (2 amazing team members), and we’re saying no to a lot of extra things. However, with my face turned toward the sun–all the feelings from 2018 still fresh and raw–I settled on a phrase that I know will help us steer our way toward a year full of purpose. I’m so resolved. I feel so light yet grounded. I feel that anything is possible again. And that is something I’ve believed for everyone else but me for entirely too long. Cheers to 2019. I’m happy to meet you.